We Got a STEEL of a Deal! Also appropriate title: We STEEL Got It! The Airstream, I mean. We had to take yet another hiatus when we discovered our frame would need to be totally redone; we expected it, but when it became our reality we had to, ya know, come up with funds and stuff. ;) Unfortunately we aren’t made of money! So poor Stella [no pun intended] sat a bit unattended for awhile.. but we would visit to get measurements, gander, dream, imagine what we would be doing to re-frame her, etc. Plus spring hit us and we were happy to enjoy the weather, take a few trips to the lake, and do some things to our house [hello flowers!]. Casey has also been using sketchup to design ideas for the interior and that’s been a lot of fun as well! But we have finally ordered our steel and it’s here, we’ve picked it up, and we’re ready to start making the new frame! And did I mention that we got a STEEL of a deal?!? ;) We have to decide what place we will be using while we make the new frame. We have a few options, we just have to figure out which will be best. We can’t wait to get started! I have no knowledge of such a task, but of course Casey does and I’m excited to learn a few things and watch the masters work. 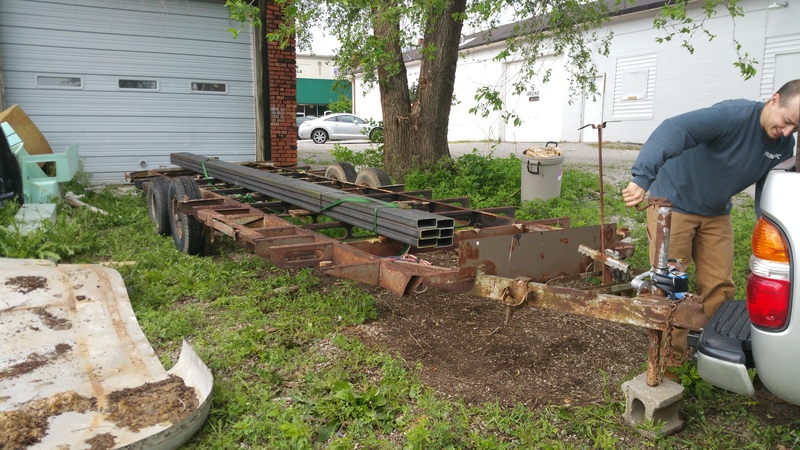 We towed the existing Airstream frame to the shop that we picked the steel up from – and without the body on it – the frame was BOUNCY. Like, I kind of feared for our lives while we drove down the road. It was the longest 7 minute car ride OF MY LIFE. My eyes were glued to the mirrors to make sure the frame didn’t crumble at every bump we hit. 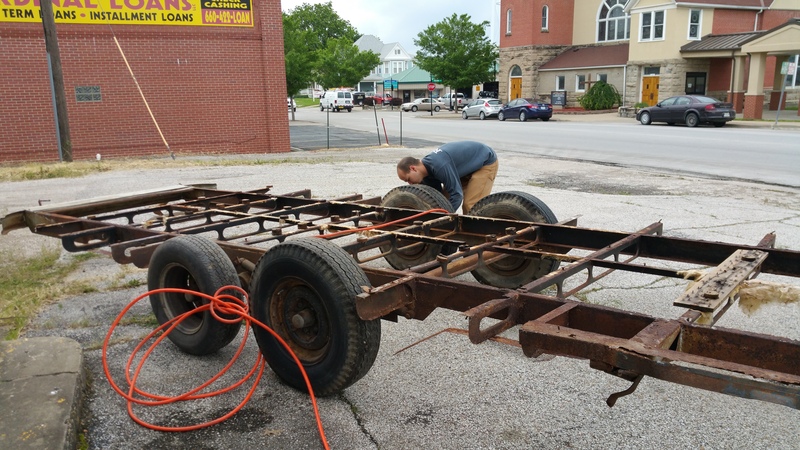 Before picking up the steel, we made sure to air up the trailer tires to ensure the safest trip possible, as we used the existing frame as a “trailer” to tow our steel home. We also plan to use the existing frame as a template for the new frame. 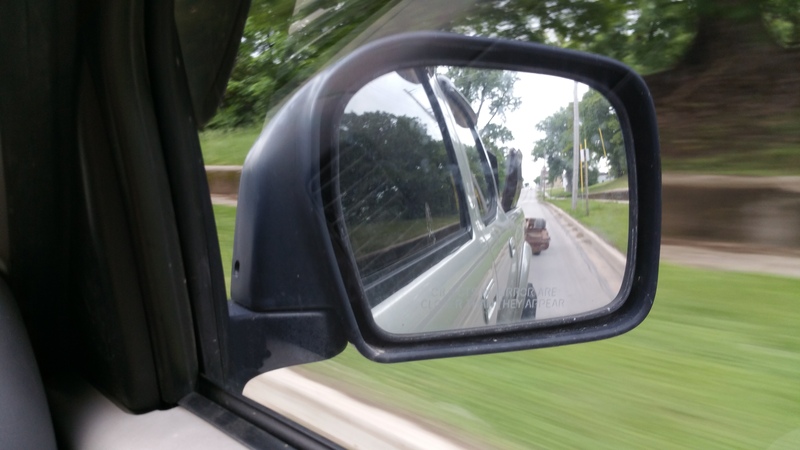 A photo of our trip to GET the steel… one day there will be a Stella in that rear-view mirror! But for now, there are crooked tires and bouncy rusty beams. Yikes! Aaaand my hot boyfriend strappin the steel down. 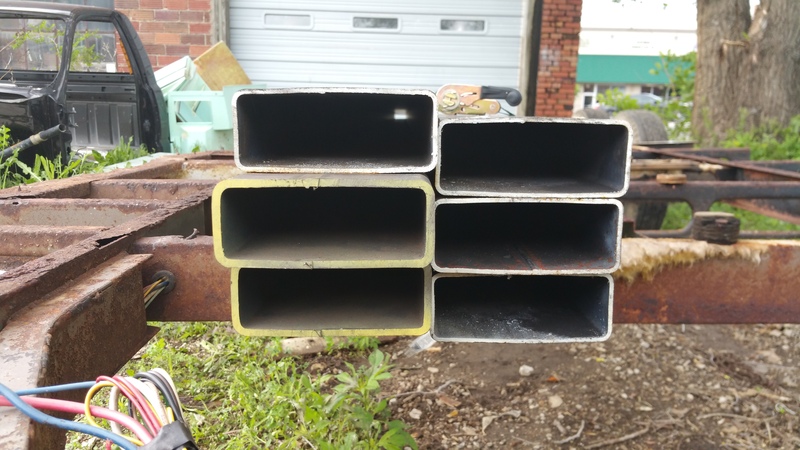 Casey ordered six 24 ft pieces of steel; two that are 3/16″ [outlined in yellow in the picture below] and four that are ⅛”. The thicker ones will be the main rails of the frame, and the thinner ones will be used for the cross members and the outriggers. 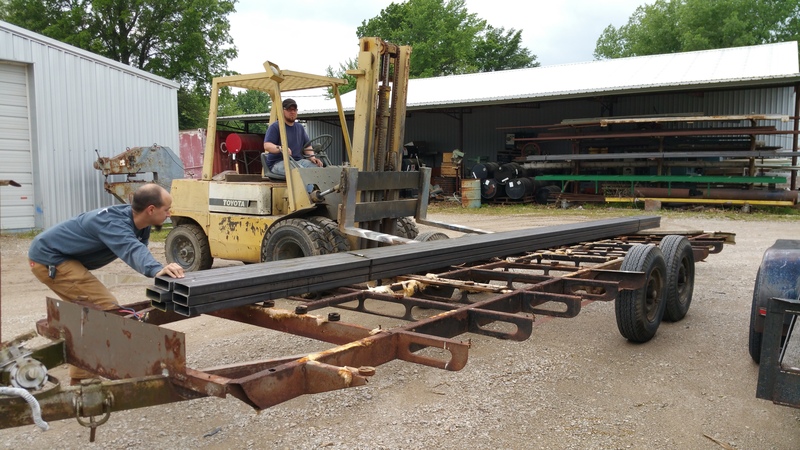 Originally we had not planned to get all 20ft pieces, however if we would’ve ordered shorter ones we couldn’t have gotten them as quickly as we did, so Casey went ahead and got the 20ft pieces and we will just cut them to size. In total, the steel weighs about 940 pounds. Cheese and rice! Next, we have to order new axles! Casey says we have to have them ready once we weld the frame. Hopefully we get to start welding soon.